I started painting things when I was about thirteen years old. Back then, it was mostly superheroes, elves, and fantasy art. I started painting with apple barrel paint on printer paper: sacrilege! Despite some of my crazy methods, my parents encouraged my creativity. In high school, I got gift cards to art stores for Christmas (I guess they didn’t want me to paint on printer paper), and they would burn a hole in my pocket until I had replenished my art supplies. I bought mostly illustration board, various strathmore papers, charcoal, oil paint, and watercolor, but I tried everything from colored pencil to oil pastels to gouache and acrylic. Charcoal and watercolor were my favorite. I painted and drew fantasy art, mostly, and portraits. I was fascinated by people, by eyes, and by faces – something that follows me to this day in my job: a headshot and portrait photographer. I didn’t particularly enjoy painting still life paintings, and I stayed away from abstract art, which I just didn’t understand. My sixteen-year-old self didn’t think of color as its own entity, or texture as being alive. My degrees in music would teach me about color later, but through sound. Later still, I became a photographer and learned to paint with light, and I now see the world in a new way: filled with textures, colors, and symphonies of its own. When I went to college, social time, homework, practicing, and rehearsals took over my time. I was more consumed by the outward and less concerned with what was going on inside of myself. I stopped painting. My art desk sat at home until almost ten years later, when I retrieved it out of my parent’s basement and brought it into my home in Kansas City. Since the advent of Pinterest, I have felt a desire to do some abstract paintings. I had no doubt mine will be a joke compared to those on my inspiration boards, but I wanted something pretty to put in my new office, so I thought I’d give it a shot. 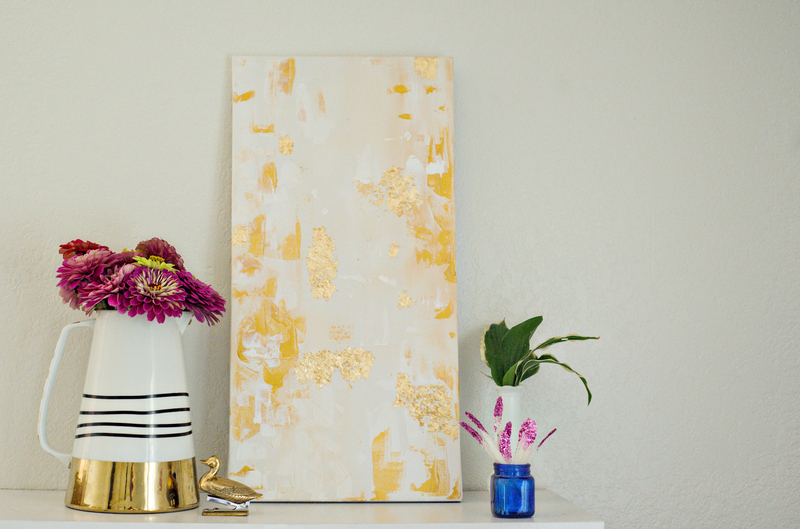 This project combines two loves: painting with a palette knife, and gold leaf. I LOVE that gold is so big right now. 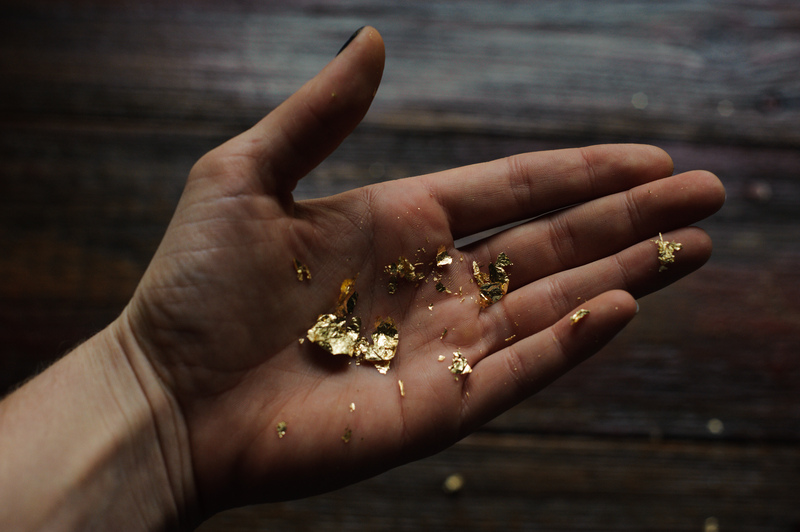 I’m very inspired by all things gold, and it has found its way into all parts of my house! There really isn’t a good way to show a tutorial for this. I just slathered on a base coat in white, and then I started to randomly glob on bits of metallic gold and white acrylic however I pleased. I mixed it in places and applied it thicker in places. 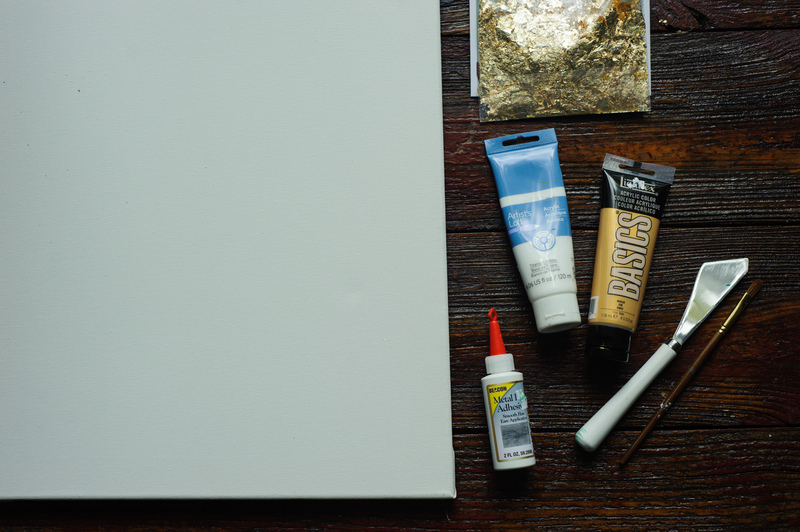 It uses a lot of paint, especially if you want to cover your whole canvas. I wanted a good bit of negative space. I also didn’t spend a lot of time thinking about balance in this piece. After the paint was mostly dry (I recommend letting it dry) I applied a thin coat of the metal adhesive (purchased at Hobby Lobby) and let it set for about a half hour, and then I applied my gold leaf. 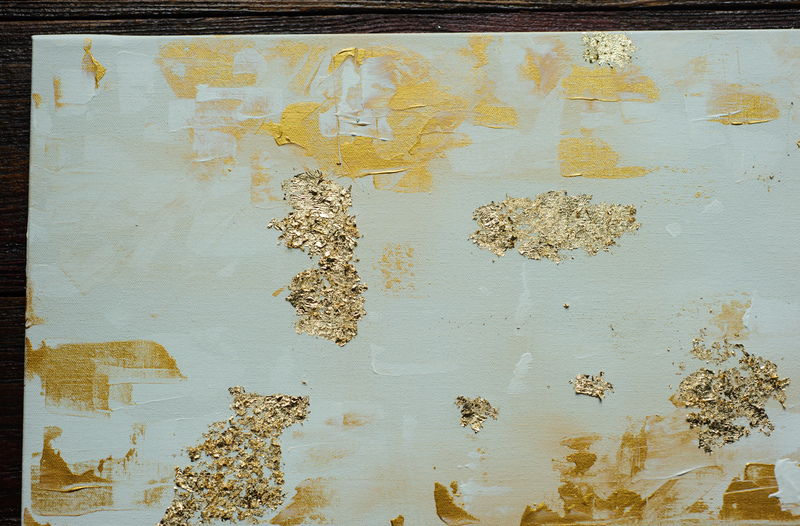 My packet of gold leaf was in pieces when I opened it (see below) and so this was a great project for it. I used the small brush to apply the gold leaf (it sticks to the oils in your skin, so applying it with your fingers is not recommended). The result was beautiful. I love this piece of art. I can’t wait to try it with other color combinations! It has a lot of textures (my goal was not to have smooth gold leaf) and it catches the light so beautifully. It is perfect in my office on the shelf above my desk! If you have done a project that is similar or if you try it yourself, I’d love to see the results!